To establish and successfully maintain a human pregnancy requires the coordinated secretion of hormones within and between the fetus, mother, and placenta. The placenta synthesizes and secretes steroid and peptide hormones that regulate hormonogenesis by endocrine glands in both the mother and the fetus. Placental hormones also act in a paracrine and/or autocrine manner to regulate growth and differentiation of placental cytotrophoblast and syncytiotrophoblast, growth and maturation of the placental vascular tree, and uterine endovascular invasion by extravillous cytotrophoblast. Moreover, the placenta metabolizes the large quantities of steroid hormones produced by the maternal endocrine glands to protect the fetus and to orchestrate the timing and development of fetal organ systems, the fetal pituitary-adrenocortical axis in particular. Clearly, placental hormonogenesis and metabolism are among the most important determinants of a successful pregnancy; however, despite the numerous advances in our understanding of placental-fetal function, our knowledge of the factors acting and interacting to regulate these processes during human pregnancy remains incomplete. As the embryo (blastocyst) is developing and moving through the fallopian tubes into the uterus, the endometrium undergoes extensive differentiation ultimately to permit embryo attachment (i.e., implantation). In virtually all mammals, preparation of the uterus for implantation is regulated by the coordinated actions of estrogen and progesterone37 produced and secreted by the ovary-corpus luteum and perhaps by the developing embryo itself.38,39 Estrogen and progesterone act on the endometrium and myometrium directly through estrogen-progesterone receptor-mediated events, and indirectly by stimulation of various growth factors (e.g., EGF, TGF-B, insulin-like growth factor I (IGF-I) and IGF-II), proteins (e.g., placental protein 14, 24 kd protein, CA-125), and cytokines (e.g., IL-1, CSF-1) (Fig. 2).40 Uterine receptivity to a putative implantation signal is limited to a discrete period of time during the luteal phase of the menstrual cycle consistent with the concept of a window of implantation that has been advanced in several animal models and in the human.41,42,43 However, despite intense investigation, the molecular basis for the transient nature of uterine receptivity, estimated to span days 19/20 to 24 of the menstrual cycle,35,44,45 remains unknown. During this interval, and presumably under the influence of estrogen and progesterone, the uterine endometrium is thickened and highly secretory in nature and becomes rich in glycogen and lipids.37 Morphologic studies have shown that uterine receptivity is heralded by the formation of pinopods on the apical surface of endometrial epithelial cells, a process that appears to be regulated by progesterone.46 Pinopods may absorb fluid from the uterine cavity, thereby making the endometrium more accessible to the blastocyst. Changes in the composition of the uterine glycocalyx have also been observed during the peri-implantation period. For example, the levels of two transmembrane glycoproteins, mucin (MUC-1) and keratan sulfate, increase on the endometrial glandular surface during the early luteal phase,9,47,48 then decrease as the window for implantation opens.9,48 Because MUC-1 is a relatively large cell surface molecule, its down-regulation may unmask smaller molecules on the uterine surface, such as the cadherins and integrins, thereby mediating specific adhesion of the trophectoderm to the endometrium. Epithelial integrins have been proposed as markers for the window of implantation in the human.49,50 Endometrial integrins are expressed in an “on/off” pattern,51 and both they and their ligands are expressed in trophectoderm.52 Taken together, these observations support the hypothesis that integrins may be involved in early implantation events. The β 3 integrin subunit is expressed on the endometrial surface after day 19 of the human menstrual cycle, just when the endometrial window of implantation opens.53 The fact that this integrin is almost never expressed by epithelial cells, but is expressed by human trophectoderm,54 supports a role for these molecules in implantation. A similar distribution of endometrial integrins and extracellular matrix proteins has been described across the menstrual cycle and early pregnancy in the baboon.55 Human secretory phase endometrium also produces the glycoprotein leukemia-inhibiting factor(LIF).56,57 LIF has the capacity to inhibit embryonic stem cell differentiation in vitro,58 and LIF receptors are detected on human blastocysts.56,57 Moreover, Stewart and colleagues59 have demonstrated that LIF (production of which is regulated by estrogen and progesterone) is essential for implantation in the mouse since implantation of blastocysts did not occur in mutated mice lacking a functional LIF gene. A similar role for LIF in humans and nonhuman primates has not been confirmed. Upon attachment of the embryo to the uterus, the uterine endometrial glycogen-containing stromal cells are rapidly transformed into large decidual cells that increase in size throughout the course of gestation. The human decidua that represents the maternal component of the placenta is composed primarily of the decidua basalis, underlying the site of implantation, the decidua capsularis that initially overlies the gestational sac but gradually disappears with advancing gestation, and the decidua vera that lines the remainder of the uterine cavity. In humans, as well as the baboon,82 the decidua produces and secretes a variety of factors that include the hormones relaxin and prolactin, the IGF-binding protein (IGF-BP-1), and a variety of other proteins (e.g., placental protein 14, also known as progesterone-associated endometrial protein [PEP], or glycodelin). Glycodelin, synthesized by the uterine glandular epithelium, shares homology with the B-lactoglobulins and retinol-binding proteins89 and has been implicated as an immunosuppressive agent.90,91 Close temporal relationships in serum profiles suggest that glycodelin production is regulated by progesterone92,93 and/or relaxin.94 Serum glycodelin levels are elevated in the luteal phase of the menstrual cycle and markedly increase during the first trimester of pregnancy. In the baboon, although the pattern of uterine glycodelin mRNA and protein expression mimics that in the human, glycodelin production is regulated by hCG,95 perhaps by direct action on the endometrium. During human and nonhuman primate pregnancy, the placenta simultaneously accesses the maternal blood and develops a vascular network for the transport of nutrients to and waste products from the fetus across the syncytiotrophoblast to ensure fetal growth and development. Both processes depend on the ability of the primordial stem-cell cytotrophoblasts to take either the villous pathway where they remain in the fetal compartment and differentiate morphologically into the syncytiotrophoblast or the extravillous pathway where they proliferate, aggregate into cell columns of the anchoring villi, and invade the endometrial stroma (Fig. 6).105 The syncytiotrophoblast covers the floating chorionic villi that become highly vascularized, whereas the extravillous cytotrophoblasts infiltrate the walls of the spiral arterioles to facilitate the process of placentation. Two other closely related proteins, angiopoietin-1 and -2, work in concert with VEG/PF in signaling vascular morphogenesis by binding to the endothelial cell-specific transmembrane tyrosine kinase receptor Tie-2. In Tie-2 null mice, endothelial cells develop and assemble into tubes, but vessels are immature, lacking branching networks, encapsulation by periendothelial support cells, and proper organization into small and large vessels.134,135 These associations indicate that the Tie-2 receptor may also mediate the capacity of endothelial cells to recruit stromal cells that encase endothelial tubes for vessel stabilization. Transgenic/gene knock-out studies further indicate that angiopoietin-1 signals Tie-2 to recruit vascular support cells and that angiopoietin-2 inhibits this action136,137,138 by competitively inhibiting angiopoietin-1-induced kinase activation of the Tie-2 receptor. During early human pregnancy, angiopoietin-1 is localized to the cytotrophoblast and syncytiotrophoblast, angiopoietin-2 to the cytotrophoblast, and Tie-2 receptor to the endothelium, 139,140 observations that are consistent with the proposed role of the angiopoietin-Tie-2 system in development of the placental circulation. Despite the importance of angiogenesis to neovascularization of the developing placenta, very little is known about the regulation of the process and the expression of the VEG/PF-angiopoitin-1/-2 system during human pregnancy. Although hypoxia is a potent stimulus of VEG/PF expression,141 estrogen has also been shown to regulate VEG/PF expression in the rat uterus142,143,144 and in human endometrial cells.145 Moreover, chronic estrogen treatment induced uterine angiogenesis in normal but not estrogen receptor-null transgenic mice.146 In the baboon, cytotrophoblast VEG/PF mRNA levels and vascularization of the villous placenta increase with advancing gestation in parallel with increasing placental estrogen production.147 Thus, the well-established role for estrogen in enhancing uteroplacental blood flow148, 149 may not only reflect changes in vascular reactivity but also enhanced angiogenesis. At the same time the vascular system is developing within the chorionic villi, a select population of extravillous cytotrophoblasts migrate and invade the spiral arteries of the uterine endometrium at the placental-decidual junction (see Fig. 6). Histologic studies performed during the first half of human, baboon, and macaque pregnancy32, 150,151,152,153,154,155 demonstrate that cytotrophoblasts migrate to and colonize spiral arterioles/arteries by displacing endothelial cells from their basal lamina and partially or completely replacing the smooth muscle component within the tunica media. Consequently, the structure of spiral arteries and the dynamics of blood flow within them are modified by cytotrophoblast invasion, presumably to facilitate implantation and placentation. As cytotrophoblasts differentiate into cells capable of invading the uterine stroma and blood vessels, their expression of adhesion molecules changes in the human,8,105,156,157,158,159 baboon,160 and rhesus monkey.154,161 As extravillous cytotrophoblasts migrate, expression of the integrin complex α5β1 and α6β4 is lost and that of the α1β1 laminin/collagen receptor is induced.158,162,163 Moreover, interaction of the α1β1 receptor with collagen type IV promotes, whereas interaction of the α5β1 receptor with fibronectin inhibits, invasion of human cytotrophoblasts in vitro.164,165 Zhou and associates105 have suggested that cytotrophoblasts balance invasion-retraining and invasion-promoting adhesion mechanisms as they differentiate. Migratory cytotrophoblast cells also express specific adhesion molecules, specifically vascular cell adhesion molecule (VCAM) and cadherins (e.g., VE-cadherin), that appear to secure cytotrophoblasts to each other and to the endothelium, thereby facilitating their migration against arterial blood flow.161,166,167 Interstitial and spiral arteriole invasion is also associated with the expression of matrix metalloproteinases (MMPs; e.g., MMP-9 collagenase), by intraluminal, extravasating, and intramural cytotrophoblasts,168,169 apparently to disrupt the extracellular matrices in the tunica media to allow cytotrophoblasts to modify the vessel wall. MMP-9 promotes cytotrophoblast invasion; the capacity of human cytotrophoblast to invade is completely inhibited by MMP-9 antibody in vitro.170 Clearly, the process of endovascular spiral artery invasion involves an intricately and temporally ordered expression of integrins, adhesion molecules, and proteinases by the extravillous cytotrophoblasts. This area of research is of intense interest and clinically relevant. Abnormal expression of several of these components has been observed in cytotrophoblasts of women who develop preeclampsia and in whom endovascular invasion is superficial.171 Unfortunately, our current understanding of the factors acting/interacting to regulate the timely expression of ECM and cell adhesion molecules by invading trophoblasts remains incomplete. Fig. 7. Molecular structures of the estrogens. The basic 18-carbon estrane nucleus, shared by estrone, estradiol, and estriol, is modified for each by differences in the number and arrangement of hydroxyl groups. Plasma concentrations of estrone, estradiol, and estriol increase as human pregnancy progresses (Fig. 8)174 with daily excretion rates at term approximating 2, 1, and 40 mg, respectively.172,174 In humans, plasma concentrations of estradiol near term range from 6 to 30 ng/mL.175,176 In women with threatened first-trimester abortion, abnormal estradiol concentrations are highly associated with a subsequent pregnancy loss.177 Moreover, a 50% spontaneous abortion rate has been observed among women having a mutation in the amino terminal region of the estrogen receptor involved in transcription.178 In the baboon, reduction of maternal estrogen levels to less than 0.1 ng/mL by daily administration of an inhibitor of placental estrogen synthesis resulted in a 66% incidence of abortion during early gestation that was prevented by treatment with exogenous estradiol.179 Low serum estradiol concentrations during the third trimester are also associated with poor obstetric outcome.180,181 Taken together, these observations suggest that estrogen plays a critically important role in the maintenance of primate pregnancy, but others have refuted this notion182 because pregnancy is maintained in most women having low estrogen levels resulting from deficiencies in various placental enzymes. 183,184 Interestingly, in those cases, although maternal estradiol levels are markedly reduced, concentrations approximate 0.45 ng/mL, or 10-9 mol/L, a concentration that approximates the dissociation constant for estradiol binding to its receptor.185 Differences in the outcome of pregnancy in various women with estrogen deficiency suggest that the important biologic effects of estradiol can be achieved with available receptor and concentrations of estrogen sufficient to interact with it. It would appear that in both human and nonhuman primate pregnancy, estrogen is produced in considerable excess. Placental synthesis of estrogens by conversion of c19-steroid precursors requires the enzymes sulfatase, Δ5-3β-hydroxysteroid dehydrogenase/Δ5-4 isomerase (3β-HSD), P450 aromatase(P450arom), and 17β-hydroxysteroid oxidoreductase (17β-HSD) (see Fig. 9). Once secreted by the fetal adrenal gland, DHA is rapidly sulfated in the fetal liver to form DHAS and subsequently hydroxylated at carbon 16 to form 16-hydroxy DHAS, the primary precursor for estriol formation. On arrival in the placenta, sulfurylated c19 steroids precursors are desulfurylated by the enzyme sulfatase to yield unconjugated DHA and 16-hydroxy DHA. Although the regulation of sulfatase is unknown, prolactin and oxytocin stimulate enzyme activity in decidual cells isolated before the onset of human labor.194 Mitchell and colleagues195 have also observed a significant increase in hydrolysis of estrone sulfate by fetal membranes at term that could increase free estrogen concentrations locally within tissues with no associated change in peripheral plasma estrogen concentrations. Unconjugated Δ5 — c19 steroid precursors in the placenta are subsequently converted to androstenedione/testosterone or 16-hydroxyandrostenedione by the enzyme 3β-HSD. A family of closely related genes encode for 3β-HSD196 and various 3β-HSD isoforms are expressed in a tissue-specific manner. The human type I 3β-HSD is expressed at high levels in placenta, whereas the type II isoform is almost exclusively expressed in the adrenal cortex and gonads. In the placenta, the multinucleated syncytiotrophoblast is the principal site of 3β-HSD expression. Recent studies have shown that the CYP19 gene encoding human cytochrome P450arom is located on chromosome 15 and consists of 9 exons and two polyadenylation sites in the last coding exon downstream from the terminating stop codon that gives rise to the 3.4 and 2.9 kb transcripts that encode human P450arom. Although the entire intron sequences remain to be mapped, the CYP19 gene is at least 70 kb long and is the largest cytochrome P450 gene characterized to date (reviewed elsewhere199). The interconversions of androstenedione and testosterone and of estrone and estradiol are catalyzed by 17β-HSD. There are at least four isoforms of 17β-HSD, with the placenta expressing 17β-HSD-1 and -2.201,202,203 Placental 17β-HSD-1 has been localized to chromosome 17 and is a cytosolic enzyme that preferentially catalyzes the reduction of estrone to estradiol but does not utilize androgens as substrates.201 In contrast, placental 17β-HSD-2 has been localized to chromosome 16 and catalyzes the oxidation of estradiol to estrone201,204,205 and of testosterone to androstenedione.204,205,206,207 Estrone and estradiol are extensively interconverted within the placenta, but these two estrogens are not secreted in equal amounts into the maternal and fetal compartments in the human,208,209 rhesus monkey,210 or baboon.211 Biologically active estradiol is secreted primarily into the maternal circulation, whereas the weaker estrogen, estrone, is preferentially released into the fetal circulation, perhaps to limit exposure of the developing fetus to estrogen. Although a carrier system specific for estradiol has been suggested to explain this selective secretion,210 differential localization of the 17β-HSD-1 and -2 enzymes within the syncytiotrophoblast may be a more likely explanation, but remains to be confirmed. The 3β-HSD, sulfatase, and aromatase enzymes are abundantly expressed in the primate placenta,191 and the production of estradiol and estrone per milligram placental protein remains relatively constant throughout pregnancy in women.212 Although cAMP and certain growth factors can modulate estrogen production by transformed trophoblast cell lines in vitro,213,214 placental estrogen production appears most dependent on the amount of substrate provided by the fetal adrenal gland, uteroplacental blood flow, and placental trophoblast mass. ACTH also has an important role in regulating elements of the steroid biosynthetic pathway in the primate fetal adrenal gland. Receptor-mediated uptake of low-density lipoprotein (LDL) cholesterol produced in the fetal liver is a major source of cholesterol substrate for steroidogenesis within the human fetal adrenal.238 Addition of LDL to cultures of human fetal adrenal cells results in increased production of DHAS and cortisol.239,240 ACTH has an important role in stimulating the receptor-mediated uptake and degradation of LDL within the human fetal adrenal to provide cholesterol substrate for steroidogenesis.241,242 In addition, the de novo pathway for the formation of cholesterol may account for up to 30% of the daily secretion of DHAS and cortisol by the human fetal adrenal gland in culture.243,244 Under these conditions, ACTH stimulates HMG CoA reductase, the rate-limiting enzyme for de novo teroidogenesis.244 The ACTH-stimulated LDL pathway appears to be the preferred mechanism for fueling steroidogenesis in the primate fetal adrenal gland, however, because the HMG CoA reductase enzyme is not stimulated in the presence of ACTH and LDL. In addition to supplying cholesterol substrate to the fetal adrenal cell, ACTH regulates specific enzymes involved in c19-steroid formation. For example, the mRNAs for and activities of the P450 cholesterol side-chain (P450scc) and P450c17 enzymes, and the hydroxysteroid-sulfotransferase (HST) enzyme that catalyzes the sulfurylation of DHA, are stimulated by ACTH in cultures of human fetal adrenal cells. 235,245,246 Moreover, betamethasone suppresses and ACTH restores expression of the mRNAs for the ACTH receptor, P450scc and P450c17, and serum estrogen levels in baboons.229 Thus, by stimulating fetal adrenal c19-steroid formation, fetal ACTH has a pivotal role in regulating placental estrogen biosynthesis during primate pregnancy. Because estrogen production is only partially reduced after suppression of the fetal hypothalamic pituitary adrenal axis with synthetic cortico-steroids,172,247,248,249 it appears that factors other than ACTH may also be important to the regulation of fetal adrenal hormonogenesis. hCG,250,251 prolactin, growth hormone, and several other peptides, including ACTH, CLIP, and MSH252 stimulate DHAS production by incubates of human fetal adrenal slices. Similar observations have been made in the baboon fetal adrenal both in vitro253 and in vivo.254 Recently, it has also been shown that placental CRH stimulates DHAS production and P450c17 expression by human fetal adrenal cells through activation of a phospholipase C-inositol second messenger system.255 Placental CRH may also regulate the maternal pituitary-adrenocortical axis. Thus, the progressive increase in maternal plasma CRH levels in human pregnancy (Fig. 12)256 is accompanied by a corresponding rise in the concentrations of maternal ACTH and cortisol (Fig. 13)257 as well as levels of DHAS.258 Interestingly, in cultured human trophoblasts, glucocorticoids increase the expression of CRH,80,259 and it has been proposed that a positive feed-forward loop involving the maternal pituitary-adrenocortical axis and placental CRH may operate during primate pregnancy (Fig. 14).260 Whether a comparable feed-forward axis operates in the primate fetus, as originally suggested by Robinson and associates,80 remains to be determined. The primate placenta possesses abundant quantities of the P450scc and 3β-HSD enzymes required to convert substrate cholesterol into progesterone. Unlike estrogen formation, progesterone production does not require direct participation of the fetus; however, in contrast to other steroid-secreting organs, the human and nonhuman primate placenta exhibits a very limited capacity for de novo cholesterol and progesterone synthesis from acetate.285,286 The elegant work of Simpson and co-workers285,287 conclusively demonstrated that progesterone biosynthesis in human placental trophoblast cells follows the classical LDL pathway first described by Goldstein and Brown288 in fibroblasts. Earlier studies conducted in pregnant women289,290 and with perfusion of the human fetoplacental unit in vitro291,292 showed that cholesterol in the maternal circulation is taken up and used for progesterone formation by the placenta. Moreover, Winkel and associates287,293 demonstrated that LDL uptake by human trophoblast cells in culture is mediated by high-affinity binding, is saturable and that LDL degradation is a consequence of cellular uptake and internalization. A receptor-mediated pathway, involving coated pits and vesicles, endosomes, and lysosome-like bodies has been identified in human placental trophoblasts for the uptake of colloidal-gold conjugated LDL.294 Henson and colleagues295 have also demonstrated the existence of high-affinity receptor-mediated LDL uptake (i.e., binding and internalization), as well as LDL degradation by trophoblasts isolated from the baboon placenta. High-density lipoprotein also increases progesterone secretion by human trophoblast cultures,287,296 but to a much lesser extent than LDL. During rat and rabbit pregnancy, estrogen is the major luteotropic stimulus that maintains the corpus luteum and progesterone production.297,298,299 Estrogen stimulates the uptake of high-density lipoprotein cholesterol substrate300 and P450scc expression in the rat301 and rabbit302 corpus luteum, thereby promoting progesterone production. During mid- to late primate pregnancy, when the placenta is the principal source of progesterone, estrogen has a similar regulatory role within trophoblasts. 2,3,191 Placental progesterone formation and serum progesterone concentrations are decreased by administration of the estrogen receptor antagonist ethamoxytriphetol283,303,304 in baboons, an effect that can be reversed by diethylstilbestrol.305 Moreover, placental progesterone production by human trophoblasts in culture is inhibited by treatment with an aromatase inhibitor and restored by estradiol.306 The increase in receptor-mediated LDL uptake307 and LDL receptor308 and P450scc309 mRNA expression in placental trophoblasts observed during the second half of baboon pregnancy when estrogen levels rise, can be suppressed by blocking the action or formation of estrogen.304,310,311,312 In contrast, placental 3β-HSD and adrenodoxin mRNA expression and 3β-HSD activity are not developmentally regulated or altered by antiestrogen treatment in baboons.281,309 Therefore, inhibiting the action or levels of estrogen specifically blocks the developmental increase in placental LDL cholesterol uptake and expression of the P450scc enzyme essential for the metabolism of cholesterol to pregnenolone in baboons. Translocation of cholesterol from the outer to the inner mitochondrial membrane accounts for the rapid increase in steroidogenesis within the adrenals and gonads in response to tropic stimulation and is mediated in large part by the steroidogenic acute regulatory protein (StAR; review available elsewhere318). However, because human trophoblast cells do not express StAR,319 other unique mechanisms may be involved in the intracellular trafficking of cholesterol within the placenta. Recent studies317 indicate that the mitochondria of human syncytiotrophoblasts exhibit a morphology that is quite different from cytotrophoblast, adrenal, or gonadal cells. Their unique structure may in some way facilitate cholesterol entry into syncytiotrophoblast mitochondria without the mediation of factors such as StAR. Various peptide growth factors (e.g., IGF-I and IGF-II) are expressed320,321 and have stimulatory effects on P450scc activity322 in human trophoblasts. EGF also has been observed to stimulate progesterone formation in JEG-3 choriocarcinoma cells in culture.85,323 The relative physiologic significance of peptide growth factors in primate placental progesterone production and their potential interaction with the other factors that have been discussed above remains to be determined. The interconversion of cortisol and cortisone is catalyzed by two 11β-hydroxysteroid dehydrogenase (11β-HSD-1 and -2) enzymes that are the product of two different genes.340,341 In the human and baboon placenta, the mRNA and protein for both 11β-HSD-1 and -2 are primarily expressed in the syncytiotrophoblast.334,342,343,344 Recently, it was demonstrated that the mRNA and protein levels of 11β-HSD-1 and -2,334 and the activity of 11β-HSD oxidase,345 in syncytiotrophoblast increases with advancing gestation and that upregulation may involve a direct estrogen receptor-dependent action of estrogen on the promoters of these two genes.346 Estrogen has also recently been shown to regulate the levels of 11β-HSD-1 and -2 protein in rat uterine endometrium.347 It has been proposed, therefore, that estradiol acts through its receptor to regulate the functional maturation of baboon syncytiotrophoblast that is further manifested by an increase in the genomic expression of the 11β-HSD enzymes controlling cortisol-cortisone interconversion (see Fig. 16). Although the estrogen-dependent up-regulation of 11β-HSD-2 is consistent with increased transplacental oxidation of cortisol to cortisone at term,330 the concomitant up-regulation of 11β-HSD-1 is surprising since the reduction of cortisone to cortisol across the placenta declined with advancing gestation; however, because the syncytiotrophoblast is a polarized cell, it is possible that once the levels of 11β-HSD-1 and -2 are increased by estrogen, the syncytiotrophoblast may undergo further development resulting in a spatial compartmentalization and functional separation of the two 11β-HSD enzymes.334,348 For example, Burton and associates 347 have shown that 11β-HSD-1 and -2 exhibit marked differences in their expression between basal and labyrinth zones of the rat placenta. Histologic development of the fetal ovary is strikingly similar in humans and other nonhuman primates, such as rhesus monkeys.369,395,396 In both species, mitotic activity in oogonia is maximal at approximately 45%of gestation, with the number of germ cells falling substantially thereafter. Meiosis is initiated in the largest oogonia (now called oocytes)by the end of the first third of gestation with more germ cells entering meiosis and proceeding through leptotene, zygotene, and pachytene stages as gestation advances (Fig. 18).397 As early as week 10 of gestation, human oocytes become surrounded by a single layer of presumptive granulosa cells, the unit now termed a primordial follicle. Ohno and Smith398 demonstrated that many oocytes regress during the early stages of meiosis unless enveloped by granulosa cells once they have entered the diplotene stage. At approximately 40% of gestation, the process of follicular development intensifies with maturation and subsequent development of primary follicles (i.e., flattened granulosa cells become cuboidal and begin to divide) occurring principally in the medullary (inner)component of the ovary. 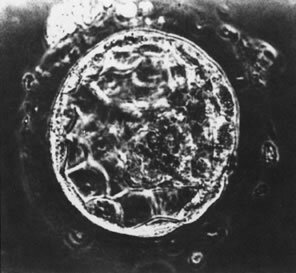 Preantral follicles containing an enlarged oocyte with a zona pellucida, multiple layers of granulosa cells, and a theca cell layer that originates from the stroma occasionally develop at approximately the 6th to 8th month of gestation in humans11,399 and near term in nonhuman primates.399,400 Finally, it has been shown that the number of degenerating oocytes increases rapidly during folliculogenesis, primarily at the expense of diplotene oocytes. By term, the human and nonhuman primate ovary is thus composed of a relatively wide cortex filled with oocytes and several primordial and growing primary follicles, including preantral follicles primarily located in the inner medullary region. Although the histologic features of fetal ovary development are well defined, our current understanding of the factors that regulate this process remains incomplete. Throughout most of gestation, the uterus remains relatively quiescent. Although uterine contractions occur, they are of low amplitude, not synchronized, and very little uterine pressure is developed. This pattern of uterine activity generally classified as Braxton Hicks contractions in humans, and contractures in baboons, rhesus monkeys, and sheep401,402 has been termed phase 0 (Fig. 19)403 of the parturition process.12,404,405 At term, the uterus demonstrates well-coordinated contractions. The myometrium becomes highly excitable and generates contractions that increase in both frequency and amplitude. Transition from a quiescent to an active myometrium is termed activation or phase 1. During phase 2, an activated myometrium becomes increasingly responsive to various stimulatory factors.405,406,407 In this sequence, the initiation of parturition corresponds to the transition from phase 0 to phase 1 or from uterine quiescence to uterine activation (see Fig. 19). Progesterone is generally considered to be a gene suppressor and indeed does down-regulate a number of genes that are considered essential for parturition, including the gap junction protein connexin 43.408,409 Moreover, progesterone alone and/or in conjunction with estradiol has been shown to restrain uterine contractility during pregnancy by (1) controlling calcium uptake/availability from external stores through both calcium channels and fast sodium channels; (2) mobilization of calcium from internal stores by regulation of α-1-adrenergic function; (3) removal of calcium from the uterine cytosol; and (4) coupling of β2-receptor to adenylate cyclase and the activation of protein kinase A to reduce calcium-calmodulin binding to myosin-light chain kinase (MLCK) and thus phosphorylation and activity of MLCK.2,12 In species in which progesterone withdrawal normally precedes labor (e.g., rats, rabbits, sheep), administration of progesterone prevents delivery,410 whereas treatment with antiprogestins late in gestation results in premature parturition similar to spontaneous labor induction. In contrast, in species in which progesterone production does not decline prior to labor (e.g., nonhuman primates and humans), exogenous progesterone does not prevent parturition at term411; however, treatment with the progesterone receptor antagonist RU-486 does lead to increased uterine activity and induction of premature labor.412 Moreover, suppression of progesterone production in late rhesus monkey gestation causes premature vaginal delivery that can be prevented by treatment with progesterone.411 Treatment with antiprogestins also increases myometrial responsiveness to contractile agents but does not necessarily result in preterm birth.413 For example, in monkeys, although antiprogestin treatment alone during late gestation does not induce labor, concomitant administration of oxytocin facilitates parturition.414,415 As discussed earlier, estrogen is also essential for maintenance of pregnancy179 and presumably, therefore, phase 0 of uterine function. In baboons, suppression of placental estradiol production by treatment with an aromatase inhibitor between early and midgestation was associated with a high rate of miscarriage, effects prevented by concomitant treatment with estradiol. The role of the human fetus in initiating parturition is not as well defined. In anencephalics and infants with other abnormalities that prevent cortisol synthesis, parturition is not significantly delayed426 ;however, in the rhesus monkey fetus, there is an increase in the distribution of both premature and postmature births after adrenalectomy427 or experimental anencephaly.233 Treatment of the monkey fetus with dexamethasone does not induce premature labor231 ; however, chronic infusion of androstenedione to pregnant rhesus monkeys increases estrogen production and results in premature birth,422 effects that are blocked by co-administration of an aromatase inhibitor.428 Interference with the conversion of androgen to estrogen locally within the placenta also blocks the patterns of myometrial contractility induced by administration of precursor androstenedione alone.428 In primates, androgens produced by the fetal adrenal as a source of substrate for placental estrogen synthesis may represent a link between the fetus and mother in the initiation of parturition.12 The role of cortisol appears more tenuous. In the human, glucocorticoids have the capacity to increase PGDH activity in the chorion429 and thereby to increase prostaglandin production. As discussed earlier, it has been suggested that placental CRH, production of which is upregulated by cortisol,430 may play a role in the onset of labor in humans.403 Indeed, maternal CRH levels are increased in women with preterm labor,431,432 and at 26 to 28 weeks of gestation, elevated maternal CRH levels may discriminate patients with apparent premature labor who go on to deliver within 24 to 48 hours from those who do not.433 CRH receptors are present in the myometrium and fetal membranes.434 CRH also stimulates the release of prostaglandins from human decidua and amnion in vitro435 and can potentiate the action of oxytocin and prostaglandins both in vitro436,437 and in vivo.438 Thus, by regulating production of placental CRH and trophoblast chorion PGDH activity, fetal-derived cortisol may play a significant role in phase 1 and/or 2 of uterine contractility integral to the onset and progression of labor.